Robot Uprising: Patrolling Your Home, Garden and Now The Streets! 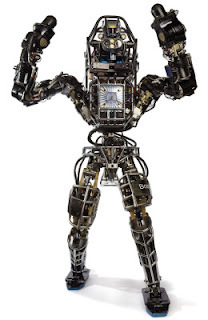 Many people think of the inevitable Robot Uprising as a humanoid, Terminator like, robot army, wielding laser guns, hunting us down in some kind of distant future, human Armageddon. What they don't realize is that the robot armies are already taking shape, albeit in a much more passive aggressive form. 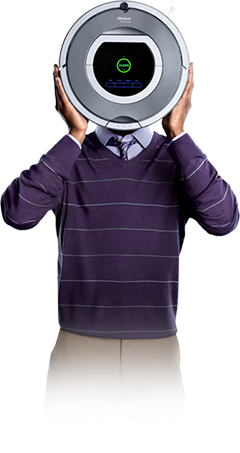 I've previously documented the Roomba as the first wave of mass produced robots surveilling your home under the guise of being a floor vacuum. These irritating devices are supposed to quietly work away in the background while you perform Yoga poses in peaceful bliss but are actually noisy enough to attract your attention and... why does the thing keep missing that one spot in the middle of the floor but has cleaned the same corner four times already! if you do your Yoga whilst she's trying to Vacuum the floor. lawn whilst he cuts the grass but Miimo will. Not content with patrolling the house, there's now a garden Roomba that mows your lawn while you meditate in peaceful bliss beside your pool. 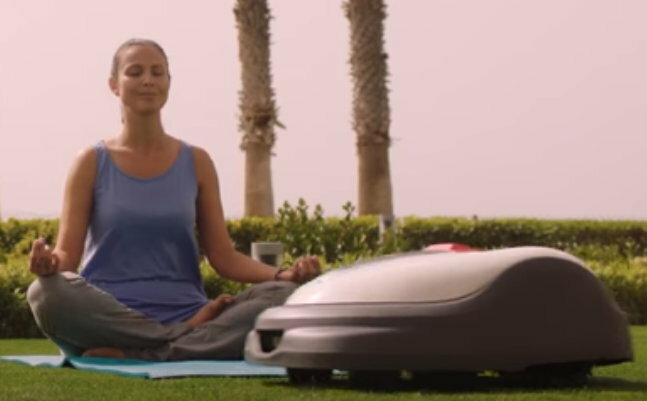 These things have actually been around for a while but Honda, whose slogan is 'The Power of Dreams', has just released their model, called the Miimo, that claims to be so quiet you can actually meditate alongside it while it mows the lawn around you. Strangely, the promotional video don't give any real clue as to exactly how loud it is. I suspect it'll be just loud enough to irritate and, if it isn't, it'll certainly get your attention as it bumps into you whilst you're sitting on the lawn meditating... and why does it keep missing that one spot in the middle of the lawn but has cut the same corner four times already! You'll probably be tempted to push it into your pool or reverse over it in the car but once somebody attaches a laser gun to it... The Power of Nightmares! safe to meditate next to. If that wasn't enough coverage for this pre Armageddon robot army. Starship Technologies has developed the best bicycle courier killer since the car door. Their new, six wheeled, small package, delivery robot - which seems to be called the 'Starship' - will be patrolling the streets autonomously under the guise of delivering all kinds goods to any location within a 2-3 mile radius of their base. In fact Dominoes Pizza in San Francisco just recently as implemented a test run for their pizza delivery service. These things can scan and detect humans, as shown in their ominous promotional video (below), with Terminator-like coldness. At the moment they'll use that knowledge to avoid bumping into you but once somebody attaches a laser gun you know it'll be telling you to step aside if you want to live! Street level coverage clearly isn't enough. No doubt you've probably heard about Amazon's flying drone delivery service known as Amazon Prime Air. 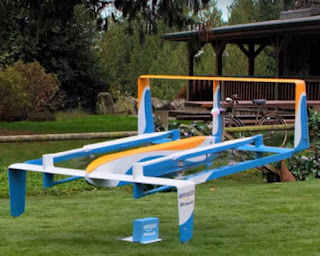 These drones have a 15 mile radius and object detection abilities to prevent them from crashing into random hot air balloons and you meditating on your lawn whilst being attacked by your Miimo. You should probably be suspicious of any package that turns up which you don't remember ordering and hope no one's yet attached laser cannons to the drone. The O-R3 Security Droid with built in Drone. 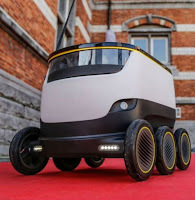 If you're not convinced that Amazon Drones and Starship's six wheeled delivery bots are patrolling our urban environments then consider this next stage in robot army evolution... the O-R3 Security Robot with built in Drone. 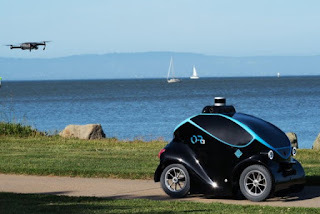 Developed in Singapore by Otsaw Digital the drone is specifically included to increase the robot's ability to track suspicious people beyond roads... yeah, jumping over a wall isn't going to keep you safe. Once they attach lasers don't go doing those Yoga poses any place you have no business doing Yoga. The O-R3 can self charge, is self learning and can call in any suspicious activity or packages to a central command station. Is anyone worried what might happen if the internet becomes self aware? Should a Terminator-like army eventuate we can at least hope we'll be relatively safe in plain sight whilst the machines check that same dark corner for the fourth time already. It's probably our best chance for survival.